In previous post, explained the CRUD operation of Spring with Hibernate, this article we can discuss about Spring Transaction Management with simple examples. A transaction is a logical unit of work that contains one or more statements. A transaction is an atomic unit. The effects of all the statements in a transaction can be either all committed or all rolled back. Transaction management is an important part of enterprise applications to ensure data integrity and consistency. Atomicity requires that each transaction is “all or nothing” which means either the sequence of a transaction is successful or unsuccessful. If one part of a transaction fails then entire transaction fails. The database value should be consistent from state to state while any data written to the database for any combination of constraints, cascade, triggers etc. Each transaction must be executed in isolation in concurrent environment to prevent data corruption. Once a transaction has been committed, the results of this transaction have to be made permanent even in the event of power loss, crashes, or errors. Programmatic means you have transaction management code surrounding your business code. This gives extreme flexibility, but is difficult to maintain and, well, boilerplate. I will discuss this in next upcoming post in details. Transaction management is separated from business code and only annotations or XML based configurations are used to manage the transactions. I will discuss this in upcoming post in details. Propagation is the ability to decide how the business methods should be encapsulated in both logical or physical transactions. if the transaction does not exist already then a new transaction will be created, if multiple methods configured with REQUIRED behavior then they will share the same transaction. This propagation states that an existing opened transaction must already exist. If not an exception will be thrown by the container. This behavior states that an existing opened transaction must not already exist. If a transaction exists an exception will be thrown by the container. This is totally opposite to Mandatory propagation. The NOT_SUPPORTED behavior will execute outside of the scope of any transaction. If an opened transaction already exists it will be paused. The SUPPORTS behavior will execute in the scope of a transaction if an opened transaction already exists.If there isn't an already opened transaction the method will execute anyway but in a non-transaction way. Isolation level defines how the changes made to some data repository by one transaction affect other simultaneous concurrent transactions, and also how and when that changed data becomes available to other transactions. When we define a transaction using the Spring framework we are also able to configure in which isolation level that same transaction will be executed. This isolation level states that a transaction may read data that is still uncommitted by other transactions. This isolation level states that a transaction can't read data that is not yet committed by other transactions. This isolation level states that if a transaction reads one record from the database multiple times the result of all those reading operations must always be the same. This isolation level is the most restrictive of all isolation levels. 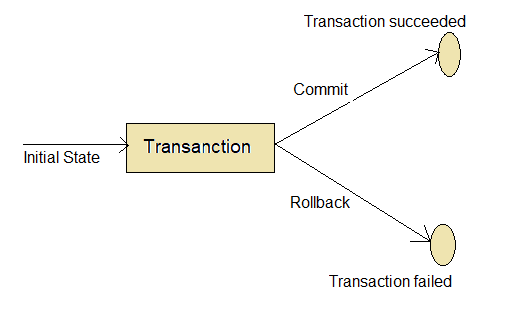 Transactions are executed with locking at all levels (read, range and write locking) so they appear as if they were executed in a serialized way.